eshots has once again been a leading sponsor for the Experiential Marketing Summit (EMS), presented annually by Event Marketer. This year’s Presenting Level sponsorship represents one of eshots’ largest investments ever for the Experiential Marketing Summit, which took place May 4-6 in Denver, Colorado. 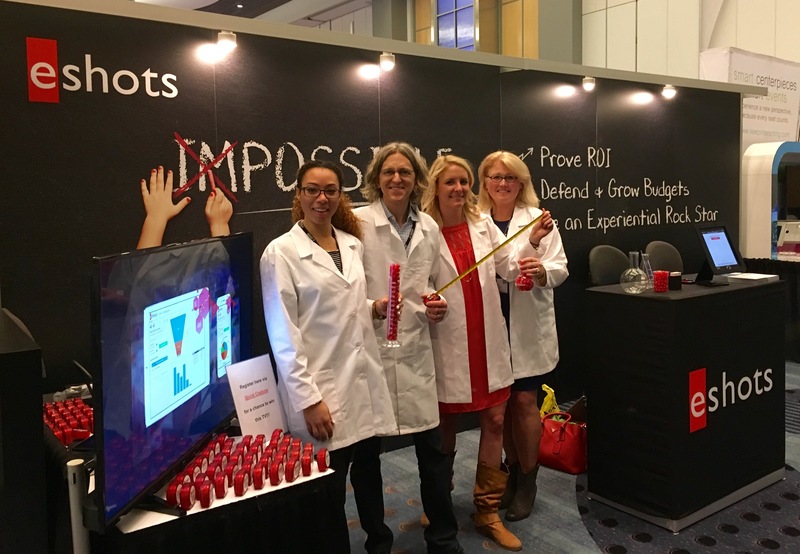 We were able to host a “data science lab” at our booth highlighting our belief that marketing is as much a science as it is an art. In fact you may have noticed our team wearing lab coats to complete to the look. eshots was everywhere at EMS 2016, most notably CEO and Founder Craig Steensma presenting back-to-back Speed Briefings. With tighter and more fragmented marketing budgets, event measurement and analytics are quickly becoming a requirement. Craig presented a detailed overview of using data to defend and grow your experiential marketing spend to two packed houses. We were also happy to announce the upcoming release of our most feature-rich reporting platform ever, Event Intelligence 5.0. This release continues the trend of eshots leading the way in experiential data reporting and analytics. Event Intelligence 5.0 will be available later this summer, visit www.eshots.com/event-intelligence for more information. We had a great time at EMS and made a lot of great new connections. If you want to learn more about eshots or get more details on EI 5.0 or any of our other solutions please email us at info@eshots.com or call 312-253-1500.